The No Exit Tour was a 1998–1999 world tour by American new wave band Blondie to promote their revival and reformation as a band and their latest album No Exit, which was released during the tour. The tour marked the band's first live performances in sixteen years, save for small festival appearances in 1997. The tour was announced in 1998 and 1999, with tickets going on sale soon after the announcements. The second leg of the North American dates was announced through NBC's Today Show in June 1999. The 13-month-long tour visited venues across Europe, with a UK and Ireland leg, Australia, before progressing to North America for the 1999 dates, with the USA leg beginning with a heavily promoted 'Blondie's Back' concert on the same day as the release of the album No Exit. Several songs recorded during the tour were released as No Exit single's B-sides and bonus tracks on several editions of the album itself. Elements of five individual shows were later collected together into the 1999 Live live album. 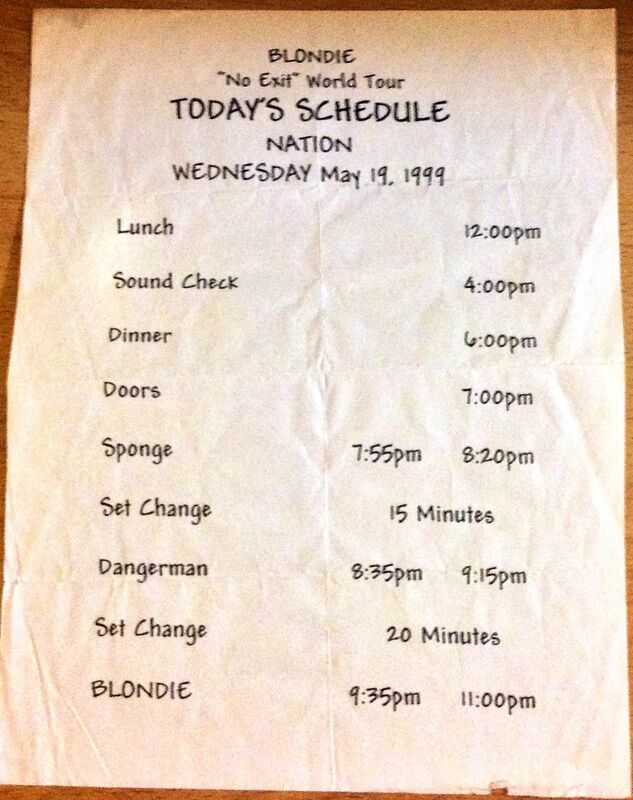 Blondie's performance on February 23, 1999 at New York's Town Hall was released on the Live video album. "Boom Boom in the Zoom Zoom Room"
"Hanging on the Telephone" and "Maria" also opened the show once or twice. "Living in the Real World" and "Heart of Glass" also closed the show on occasion, along with "In the Flesh", "Denis", "One Way or Another" and "The Tide Is High". Songs like "X Offender" and "Sometimes I" (Plasmatics cover) also appeared at various concerts. "Nothing Is Real but the Girl"
"Forgive and Forget", "Atomic", "Call Me" and "Rip Her to Shreds" also opened the show sometimes. "Heart of Glass" and "One Way or Another" alternated closing the show, with "Atomic", "Call Me" and "The Tide is High" also closing the show once or twice. "Shayla", "X Offender" and "Boom Boom in the Zoom Zoom Room" appeared in some concerts. "The Dream's Lost on Me"
^ a b "American Tour Dates". blondie.net. Retrieved 2014-01-10. ^ "Past Dates". blondie.net. Retrieved 2014-01-10.